Trail signs in the city are brown with white type, signs along the trails are green with white types, and there are interpretive signs. All will have the round 4T logo which will help guide you. Trail is well marked with signage so you know where to go (see picture below), but it is always good to take a trail map. 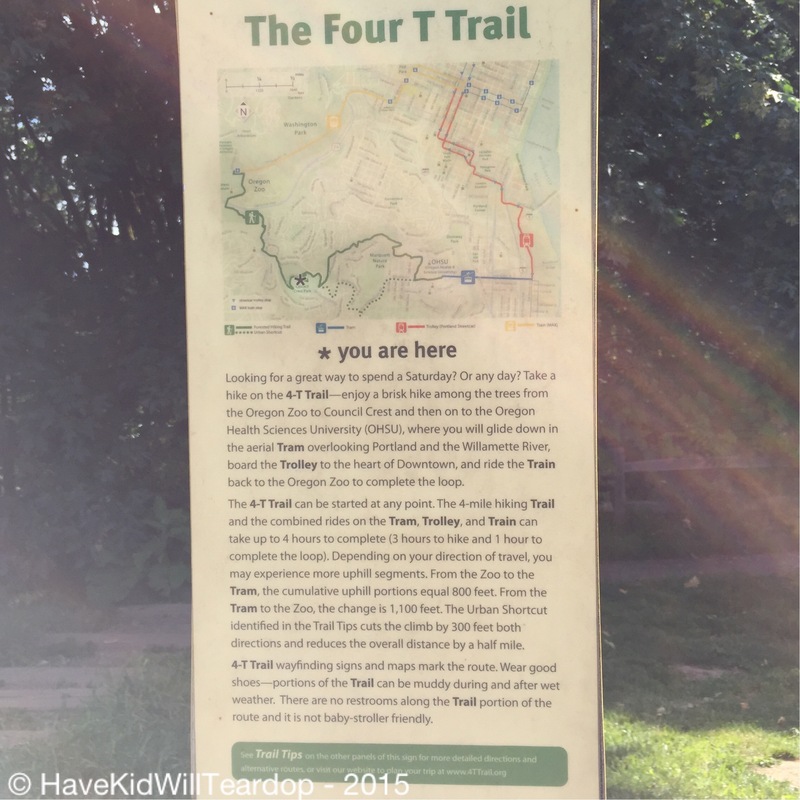 The 4T Trail map can be found here. This is a longer hike with elevation gain, but is good for kids. They might need rests, will need snacks, and plenty of water. Leaving the fun trains and trams to the end makes for a good goal to work towards! Portland has been classified as one of the most walkable cities in the U.S. We have trails all over the place. Some are beautiful nature walks, others are gritty urban walks, some take you through gorgeous neighborhoods, and trails like the 4T Trail give you a little of everything! Last night we were trying to figure out where we were wanting to go for our walk this weekend. My husband wanted to stay as close in as possible because school has just gotten out and our traffic patterns are showing it. When I suggested the 4.2 mile 4T Trail, I was met with some resistance until I explained the way the loop works. This is a complete loop, and you can choose to park anywhere on the loop (click here for the best trailheads), but most people start at the Oregon Zoo. Parking for the day will cost you around $6.25 (they love to write tickets up there, so make sure you pay!). You then walk 4.2 miles to OHSU where you catch the Tram. At the base of the Tram you catch the Streetcar, and you ride that to catch MAX which returns you to the zoo parking lot. The 4 T’s are Trail, Tram, Trolley, and Train! Both boys were “in” at the mention of trains and trams, so we got up early to start our trek. Getting there before the zoo opens (at 9:00a) is a good idea since the lots will fill up, especially on weekends. Plus, going early means cooler temps on warm summer days! Here are the details by section! This is a longer post, so bear with us! If you are like us, you will start your walk at the Zoo parking lot. Tip: This is the last bathroom access you will have for a while. If you need to use one, head over to the Zoo. Just inside the ticket booths are restrooms off to your right. This part of the zoo does not require the entrance fee. From here there are two ways to get to the main trailhead. We chose to follow the main road that takes you into the Oregon Zoo from Hwy 26 as there is a nice sidewalk and there are easy to find trail markers. There is also a path behind the Portland Children’s Museum you can take (have a look at the trailmap). Both will meet up near the Hwy 26 on/off ramps, where we crossed over the highway overpass. As you are crossing these roads use caution and make sure drivers see you (they might be very excited about their zoo visit and may not be watching for you). Once we crossed over the overpass, we turned left and walk on the shoulder of the east-bound on-ramp. About 200 feet down we found the trail marker on our right which lead us up the hill (as you can see in the picture above). This trail is a very well maintained trail with a series of stairs, boardwalks and zigzags that will lead to the Portland Heights Neighborhood. This section of trail is around a half mile and will let out on SW Patton Road. Take a right and follow the road up to the Shell gas station on the corner. At that gas station we turned left, up the hill onto SW Talbot (like my boys are doing in the picture on the left). Follow SW Talbot up and around a few corners until you come to an intersection (about 2 blocks), where you will see a paved walk way going into the woods. That is the way up to Council Crest, one of the most scenic and wonderfully historic parts of Portland. Currently it is one of the hills that is home to our radio and tv towers, as well as a watertower and is a lovely park that many people walk/hike or bike to. It affords one a view of our grand “Rose City” as well as giving folks views of 5 of our nearby volcanic mountains on clear days. There is no trace of the amusement park (from 1907-1929) that was once perched atop this hill. Portlanders could ride a trolley up the hill to enjoy a nice day out. It was considered “The Dreamland of the Northwest” in those days. These days it is a lovely place to enjoy a beautiful day, perhaps a picnic and has become a different kind of dream land for current residents. As we worked our way around the watertower (following the trail signs), we came to one of the 4T Interpretive signs (they look like the signs at the start of each of my sections). 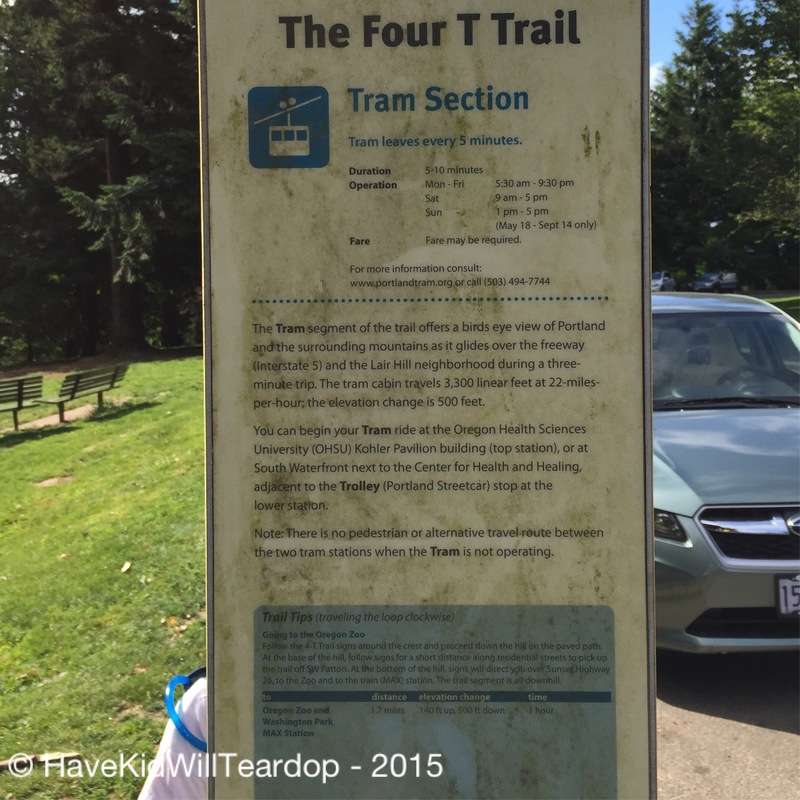 This gives you all sorts of information about the various legs of the 4T Trail. From here we turned left and followed the trail down the hill and into the Marquam Nature Park. This is the point where you will decide if you want to take the slightly shorter Urban Route which will require you follow various streets through neighborhoods, or the Forest Route which keeps you within the Nature Park, but requires you cross three roads in a one mile section. I suggest the Forest Route if you are doing the hike with kids as the streets have no sidewalks, there are very narrow shoulders and quick drivers. 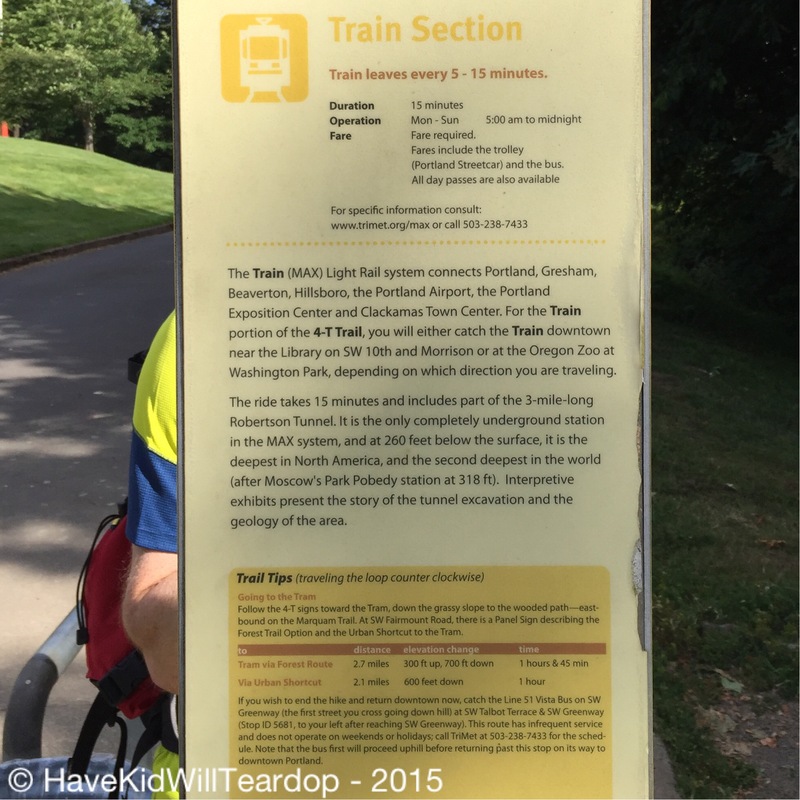 For these reasons we chose the Forest Route and followed the path through the Marquam Nature Park to the Marquam Nature Shelter. The Nature Shelter gives you history about the area and acts as an amphitheater coated in beautiful tile and ceramic creatures representing our native wildlife. If you check the pamphlet holders on the signage you will see a fold out with lots of pictures and descriptions. We spent a few minutes playing, “Can you spot?” where we looked at one of the pictures on the pamphlet and tried to find the animal or plants in the mural. Our son really enjoyed that while running from level to level pointing out the Pacific Wren or the False Solomonseal and so on. When we finished that, we continuted on the 4T Trail which took us up another hill for roughly .7 miles. While walking along this section we were in a beautiful gully which opened up a bit at the top to reveal the backside of some of the massive OHSU buildings to our left and some precariously perched aparments on our right. As we marveled at the support structure of the apartments we noticed 2 young deer grazing to our right. You just never know what you are going to see, so keep your eyes open! As we got to the top of the hill, the trail opened up to SW 9th and we continued straight ahead to the corner (SW Gibbs). There we turned left and went down the hill towards the main hospital. There are 4T signs, but from here you can also just follow the signs directing you towards the Tram. 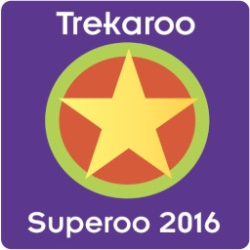 Once you reach the Tram, the walking portion of this trek is complete! Now you and/or the kiddos get to sit back and enjoy the ride and more adventure! The Portland Aerial Tram is an engineering marvel that takes folks from the top of OHSU down to the SW Waterfront area (and vice versa). It connects the two campuses of OHSU. When we have visitors come to stay with us, the Lad always suggests that we take them on a Tram ride. This has been a favorite of his! The views from the top are stunning on clear days – you can see the Willamette River snake its way north giving folks a sense of Portland and it’s layout as well as the natural environment that surrounds it. The ride on the way down is free, so if you start at the top, going through the loop in a counter clockwise motion (like we did), you will not have to pay. If you ride up the tram, there is a fee of $4.35 per person (kids under 6 are free). The pay box is at the bottom Terminal and accepts cards (debit/credit) only. The Tram runs daily (M-F 5:30a-9:30p, Sa 9:00a-5:00p, Su 1:00p-5:00p however the sunday service doesn’t run during the winter between Labor Day and 18 May, so check their website in the link above for more details). If you arrive here during the times it is not running, there really isn’t a direct alternate route for your to take. You will have to catch one of the busses that will take you directly downtown. On the Tram, you will fly 3,300 feet (with a 500 foot elevation loss) passing over the Lair Hill neighborhood at 22mph. We watched hawks and crows playing in the wind as we rode and you can also spot other wildlife living in the area. The big bump at the end, where you go over the riblets at the tower, is always fun as your tummy sinks a little bit. The entire ride takes about 3-minutes total. Once the doors open at the bottom, exit and walk out and to your right. You will see a streetcar shelter directly in front of you on the corner and this is where you start the next leg of your adventure! If you are hungry wait to buy your ticket for the Streetcar, and check out a restaurant in the area. There are several cafes to grab a bite to eat. One of our favorite places to grab beautiful sandwiches and massive salads is Lovejoy Bakers, which is just across the stree and down one block from the Tram Terminal (3159 SW Moody Ave). Check it out! We, and our guests, have never been disappointed! The Portland Streetcar is the next leg that took us from the SW Waterfront to central Downtown. Trolleys were a big part of Portland history. In the early 1900’s they were the only form of public transport that shuttled Portlanders around the city. Our modern Streetcars are very remniscent of those early trolleys and have found their way back into the heart of the city’s residents. This is part of the Tri-Met system, so when you buy your ticket it will be good for both the Streetcar and MAX as long as you use it within the 2-hour window (if you buy the Tri-Met Adult/Youth tickets). The tickets are $2.50 for adults and $1.25 for kids. The Streetcar runs continuously around an 8-mile loop so wait times are minimal. The Streetcar Shelter has a readerboard letting you know when the next trolley will be coming to help answer all of the kids questions, which are all usually about when it will be there. I had no idea how many ways that same question could be asked. Once we boarded, we rode the Streetcar and exited at the Central Library stop after weaving through the Waterfront, University area, and the SW Park Blocks. The beauty of the tickets you buy, you can get on and off as much as you want. You just need to be mindful of the time as you have 2-hours to get back to Washington Park, unless you don’t mind buying extra tickets. The ride was around 15 Minutes to the Central Library. We decided to take a quick detour into the Library before boarding MAX. This part of town is also very near Pioneer Square, many of the food carts and several restaurants as well as shops, in case you were hungry or needed some things! The Max stop is just a block down SW 10th on Morrison, which brings us to the final leg of the loop! The final leg of the journey starts at the corner of SW 10th & SW Morrison at the MAX “Galleria” stop. Trains come every 5-15 minutes depending on time of day. The ticket you bought for the Streetcar is also good on the MAX as long as you are in your 2-hour window, so just step aboard your west-bound train. The MAX will head up the road and wind it’s way through Goose Hollow, passing Providence Park (our MLS Portland Timber’s/Thorn’s Stadium) and into the tunnel that takes you directly to Washington Park. The ride is quite short at around 15 minutes, but is the perfect end to this big adventure. When you get out of the train, take a look at the amazing Core Sample and geologic display that lines the platform. Also, you will know which platform you got off on as the East Bound platform has yellow roof girders representing the sunrise and the West Bound platform has orange girders representing the sun set. Head over to the elevators and travel up 26 floors to the parking lot and find your car again. Congrats! You have finished the famous 4T Trail! This is one we all really enjoyed and will definitely do again. We will park in a different area next time, just to change things up! Tip: We hiked this in a very dry time, but looking at the trail when the rains are here it will get very muddy and slick. Boots with good traction are going to be your best choice for your walk. 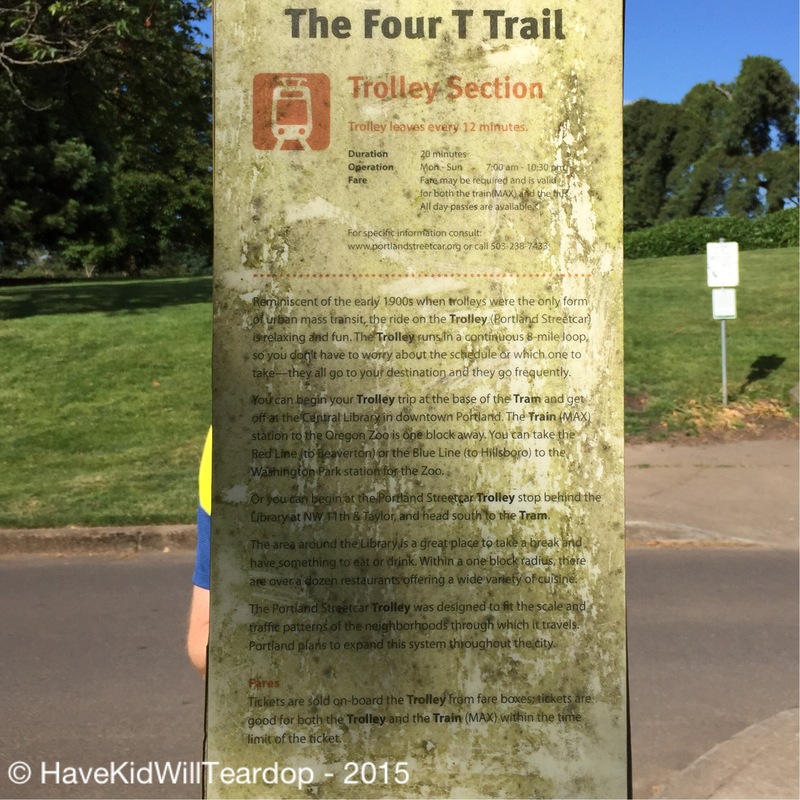 Have you done the 4T Trail? What did you think? What were your favorite parts and did you do the Urban or Forest Route? Tell us in the comments below!